Chinese telecommunications firm ZTE has signed a deal with the United States that lets the crippled company get back in business, Reuters reports. ZTE was almost totally shut down after the Trump administration cut off exports of U.S. made parts to the company. It was, in the words of one expert, “caught red-handed” putting the U.S. technology into products and selling them to countries under U.S. trade embargoes, including Iran and North Korea. ZTE depends on U.S. parts for wireless stations, optical fiber networks and smartphones. According to Reuters, the deal to get ZTE operating again included a $1 billion fine, regular inspections of its plants and the replacement of its team of executives. Neither ZTE nor the U.S. Commerce Department has confirmed that any definitive deal was signed. But the reports already have U.S. lawmakers angry that the Trump administration is willing to let ZTE resume using U.S.-made components. 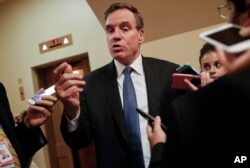 FILE - Senate Intelligence Committee Vice Chairman Sen. Mark Warner, D-Va., speaks with reporters on Capitol Hill in Washington, Sept. 27, 2017. Republican Senator Marco Rubio of Florida has also called ZTE a security risk and said a bill to block the U.S. from doing business with it would have huge support in Congress. Trump has often complained about China stealing U.S. jobs and having a huge trade deficit with the U.S. His tweets in support of China and ZTE perplexed Congress and many economic experts.